This is necessary after the grandstanding Acosta made a mockery of the President’s post mid-term election news conference. It was another example of Acosta’s bad behavior. After asking several questions, the President tried to move on to another reporter. 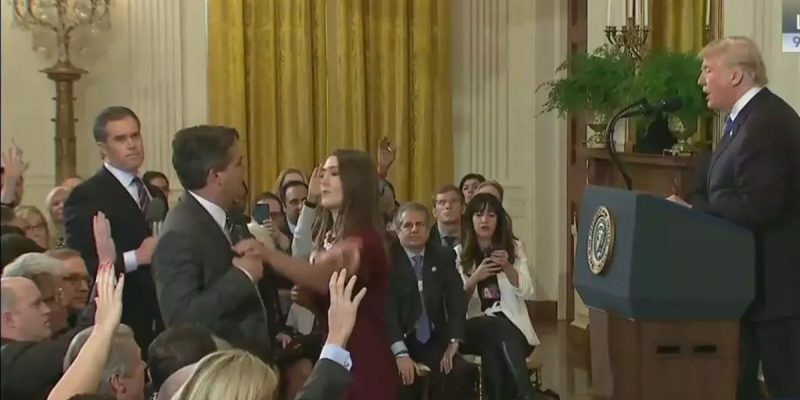 Incredibly, Acosta refused to relinquish the microphone to the intern who was trying to give another reporter an opportunity to ask a question. After such antics, the White House was fully justified in revoking Acosta’s press pass. The decision caused an uproar in the press. CNN filed a lawsuit against President Trump and several members of his administration demanding that the press pass be restored. The lawsuit was joined by many other media organizations including Fox News, who filed a “friend of the court” brief backing CNN. The antics of Acosta and his colleagues were not supported by famed Watergate reporter Bob Woodward. He argued that instead of a lawsuit, the remedy was “more serious reporting.” He said too many reporters have become “emotionally unhinged” by President Trump. In his ruling, Judge Kelly decided that Acosta’s pass should be temporarily restored, not on First Amendment grounds, but due to a violation of his Fifth Amendment rights of due process. Judge Kelly did not establish that Jim Acosta and CNN have a constitutional right to a White House press pass. There are thousands of news organizations and tens of thousands of reporters who do not have such a coveted pass. The court did not validate the claims of CNN that Acosta’s “First Amendment rights of freedom of the press” were violated. If the court did make such a decision, every reporter in America would have a claim to a White House press pass. All Americans should embrace the First Amendment and our precious rights, including the freedom of the press. Clearly, the United States has a free press because 95% of the media are opposed to the President of the United States and there is no effort to prevent them from operating. No U.S. President has ever faced a more hostile press than Donald Trump. Despite the intense opposition, he provides regular opportunities for the media to ask questions, such as his most recent White House news conference that spanned 87 minutes. Unfortunately, some members of the press try to take advantage of their opportunity to ask questions. These news conferences should work in an orderly manner with the reporters being identified by the President, then asking a question, an answer being given, and the microphone being passed to another reporter. Sadly, such good behavior is not apparent in White House news conferences. In today’s anti-Trump media environment, reporters like April Ryan of American Urban Radio Networks stand up and shout questions without being asked. At the last press conference, the President refused to answer a question that Ryan shouted. Not surprisingly, some of his critics labeled it racism because Ms. Ryan is African-American. The charge is ridiculous because the President answered questions from other African-American reporters. The President must be the only person conducting the press conference. It must be Donald Trump, not April Ryan or another other reporter, determining who gets to ask questions. When a reporter like Ryan or Acosta acts like a child and refuses to relinquish the microphone at a press conference, he or she should not be allowed to come back to that type of setting. There are other reporters who have a right to be heard. These reforms will be crucial for Acosta and his colleagues have treated the President and Sanders in an atrocious manner. It is disgraceful enough for CNN and other networks to allow such bad behavior on their airwaves, but the President and his Press Secretary have a right to prevent it from occurring during their news conferences.